Egg protein is made from egg white. It is fat-free and very high in protein. Egg protein is considered a perfect protein source because of its complete amino acid, branched-chain amino acid and glutamic acid makeup. It scores a 100 on the biological value index, meaning it contains all of the essential amino acids. 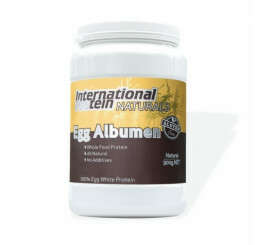 The name of the egg white protein in powdered supplement form is egg albumin. It is used by bodybuilders to add high-quality protein to their diets in the same way whey or casein protein does. Egg protein is the efficient, superior quality protein with a Protein Efficiency Ratio (PER) of 3.8, which is one of the highest of any source. A higher PER means better utilisation of the protein by the body. Egg protein also has a high absorption rate of one and-a-half to three hours. It garnered a 1.0 for maximum value on the Protein Digestibility Corrected Amino Acid Score (PDCAA). It is an index which measures protein quality and completeness. Among egg protein powder's benefits is its cholesterol-free ingredients. Some people steer clear of whole eggs because they are thought to be high in cholesterol. This is true but they are also loaded with good cholesterol, a necessity for excellent cardiovascular health. In any case, consuming egg protein powder provides you with 22 to 24 grams of protein per serve without the high levels of cholesterol. As it is lactose-free, it is a great alternative to whey, casein and whole-milk proteins if a person is allergic to milk or is lactose intolerant. 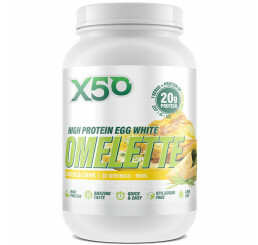 In addition, egg protein powders are rich in BCAAs that promote protein synthesis and ensure that the nutrients consumed throughout the day are fully utilised by the body. The amino acid arginine is also found in eggs and helps stimulate the production of nitric oxide. This in turn helps dilate blood vessels for better blood and oxygen circulation and increased energy levels. What's more is that it has virtually no carbohydrates or fat. This is especially helpful if a person wants to lose some weight. Egg protein consumed at 0.88 grams per pound of body weight has also proven to be beneficial for overtraining prevention. The overall bodybuilding and fitness goals will be positively affected by the consumption of egg protein because some studies suggest it also helps with recovery time.